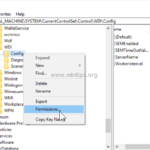 Last updated on February 22nd, 2019On a Windows 10 based the 'Windows Shell Experience Host' app, cannot be re-installed (re-registered) by using the "Add-AppxPackage" PowerShell command, with error: "Microsoft.Windows.ShellExperienceHost Deployment failed with HRESULT 0x80073D02. Last updated on February 18th, 2019One of my customers, brought his Dell Inspiron 15-3567 laptop, to our service store with the following boot problem: "The Operating System Loader signature not found in SecureBoot database ('db'). All bootable devices failed Secure Boot verification." Last updated on February 13th, 2019If you have connected an external hard drive formatted to GPT partition table, on your TV, you have probably realized that the TV cannot recognize the USB drive, or it recognizes the drive but it cannot read the contents on it (Videos, Photos or Music). Last updated on February 11th, 2019The following error may appear after updating Windows 10: "C:\Windows\system32\config\systemprofile\Desktop is unavailable. If the location is on this PC, make sure the device or drive is connected or the disc is inserted, and then try again. How to Move Google Apps Domain Website to Another Host. Last updated on January 23rd, 2019In a previous tutorial I explained the way to automatically backup your Outlook data in Outlook 2003 and 2007 versions using the Personal folder backup tool, provided by Microsoft. Last updated on January 17th, 2019On a Windows 7 computer, with Office 2013 installed, suddenly all DOCX files were not displayed with the default Word icon in Explorer, even though the DOCX file association was set up correctly and all docx files opened without problems with Word 2013 application.